Delhi Chief Minister Arvind Kejriwal rescued by an attack from protesters while he was attending a party function being organized in outskirts of Ludhiana. According to reports protesters of Akali Dal and Danga Peedit Association were agitating outside the venue where function was being organized. The protesters attacked the car of CM Arvind Kejriwal by throwing stones on his car which broke the windshield of car, fortunately not any stone reached to Arvind Kejriwal. The spokesperson of Aam Aadmi Party it was “orchestrated attack” in which police personals standing close of car of CM were targeted with stones and rods. Reports reveal the police was aware about the presence of protesters and therefore decided the exit of Shri Kejriwal from back door of banquet hall about which protesters came to know. And as soon as Mr. Kejriwal came out from the function they started pelting stones and rods on Innova in which Kejriwal was traveling. The wind shield of vehicle is reported to broken by attack. Commenting on this attack Delhi CM said that going through his visit to Ludhiana the members of Akali Dal and Congress were nervous and attacked his car with stones and sticks. He also added that both these parties cannot break his courage. It should be noted that Delhi CM was on five days tour of Punjab to meet the people of Punjab before the assembly polls scheduled to be held in 2017. Tweeting on attack Mr. Ashish Kheta, AAP party leader said “In a well orchestrated attack the goons sent by Badals attacked Kejriwal’s car with stones & rods as police stood by. 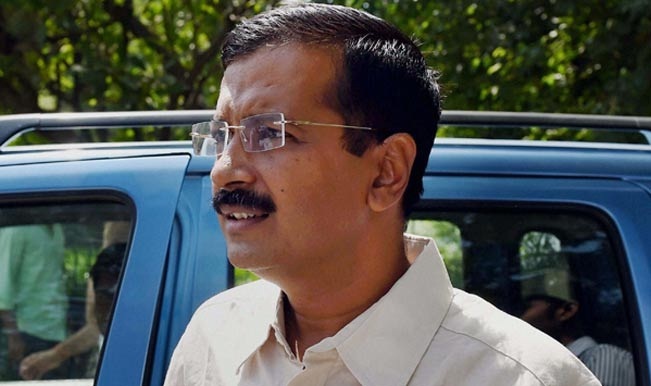 “The attackers came within an inch of grievously injuring Kejriwal. It was by only God’s grace that he escaped unhurt,”.